Nate Jackson, who played six seasons as a tight end and special teams player for the Denver Broncos, described Heads Up as “a product that the NFL is selling” to “create the illusion that the game is safe or can be made safe.” The tackling techniques are “laughable,” he said, when applied to game and practice situations, with players moving at high speeds and colliding from different angles with their heads. Jackson, the former Broncos tight end, agrees that the real-world application of Heads Up Tackling is where the program falls apart. The head, he said, has become an inextricable part of football, as inseparable to the sport as it is to the human body. Jackson said the NFL would be better off discussing the game’s realities with parents. Nate stands exactly where I do with this. Full disclosure on this injury as it relates to the game; players should not use the head/helmet as a weapon and explain that in this game – as we currently know it – the head will be a part of it. Knowing the risks and understanding identifying the concussion to get the proper treatment is the current idea of “best practices”. I have written plenty of posts about why we are faced with the current issue, this one being my latest, and until only recently have people begun to understand/grasp the issue. I commend USA Football for their strident effort to educate and attempt to eradicate the offensive use of the head, that is worth something to me. However, hitching your wagon to something that currently appears as impossible may not be the best idea. Next Article How Do We Know If Anything Is Working at NCAA Level? Totally backwards. Why t.rust anything the \nfl says? These guys love to make martyr/heroes out of the cripples they create… or have been doing for years. The whole country in fact/ remember when Nick Buonoconti’s son was made a quad. at on of the Florida big time programs? The point should be not make the program seem more appealing/less dangerous.. but how to warn a kid off from the risk of sustaining a crippling injury without yet having passed a quarter of a normal life-span. What is the incremental benefit in the end? IF the first principle of medicine were (but it has not been, for many, for a long time) then medically trained people would not participate in this brick-walling. There client must be the individual they are treating, not the activity/league etc. And failure to disclose material evidence that would influence one’s beginning/continuing a high-risk activity, is negligence imo. The doctor is supposed to help the patient give informed consent. The simplest argument against this “Heads Up” tackling program and education of technique as a good way to change concussion in football is that the head does not have to receive any contact in order for a concussion to occur. 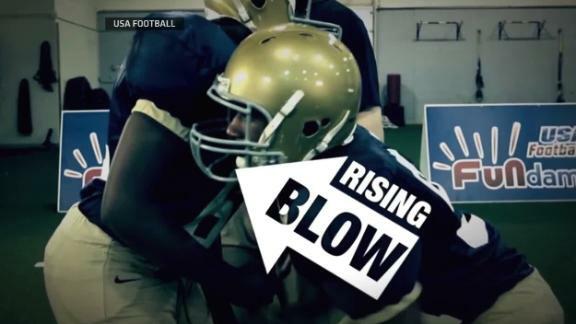 Research as shown that a larger number of concussions are caused by a blow to the body. Many researches will tell you that the rotational forces or acceleration of the head once the body stops moving is just as dangerous if not more dangerous than the actual blunt for trauma to the head. Love what you are doing spreading the word about the sad truth about the game we all loved. My only comment about the heads up tackling entry is that you fail to impress upon people that your brain shakes when you collide with something. You will still have concussions and sub concussive brain injury whether you use your head or not. We at Soldier Sports have a new product on the market this year-the Heads Up Sensor. This device fits into the earhole of the football helmet and alerts the player when his head drops below a 90 degree angle. We are out to prevent injuries instead of identifying them. This is the pefect affordable training aid that is proactive. This discussion is important to the extreme in protecting America’s youth in sports today. Football damages the brain. The evidence seems to mount daily in horrific stories of ex-players and emperical science. Monitoring this legacy of CTE in the fatally flawed king of sports. Please don’t bury this story.